Witchcraft and magic…..Don’t get taken by it – I Am Not Ashamed Of The Gospel Of Christ! The Lord has a controversy with anyone who chooses to serve other gods or standing images(statues),also to follow witchcraft,soothsayers and the like! The time will come when the Lord will execute His vengeance upon all who looked for other avenues other than serving Him(Micah 5:12-15). 12 And I will cut off witchcrafts out of thine hand; and thou shalt have no more soothsayers:13 Thy graven images also will I cut off, and thy standing images out of the midst of thee; and thou shalt no more worship the work of thine hands.14 And I will pluck up thy groves out of the midst of thee: so will I destroy thy cities.15 And I will execute vengeance in anger and fury upon the heathen, such as they have not heard. What some people may not know that take witchcraft as something harmless is that in Gods eyes it is as a sin just like to be rebellious against Him is. This was a hard lesson for Saul to accept since he was rejected by the Lord to be king of Israel as he showed rebellion(1 Samuel 15:22-26). 22 And Samuel said, Hath the Lord as great delight in burnt offerings and sacrifices, as in obeying the voice of the Lord? Behold, to obey is better than sacrifice, and to hearken than the fat of rams.23 For rebellion is as the sin of witchcraft, and stubbornness is as iniquity and idolatry. Because thou hast rejected the word of the Lord, he hath also rejected thee from being king.24 And Saul said unto Samuel, I have sinned: for I have transgressed the commandment of the Lord, and thy words: because I feared the people, and obeyed their voice.25 Now therefore, I pray thee, pardon my sin, and turn again with me, that I may worship the Lord.26 And Samuel said unto Saul, I will not return with thee: for thou hast rejected the word of the Lord, and the Lord hath rejected thee from being king over Israel. God gives us strong warning to stay clear of mediums or wizards as to meddle with them will defile us. As christians that is the last thing we would want! (Leviticus 19:31). 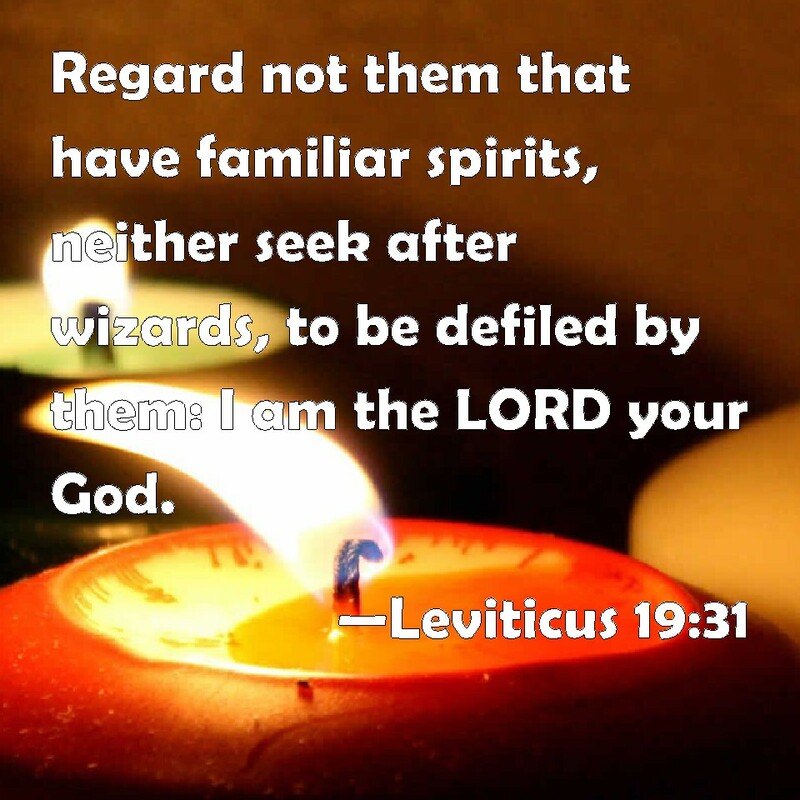 31 Regard not them that have familiar spirits, neither seek after wizards, to be defiled by them: I am the Lord your God.